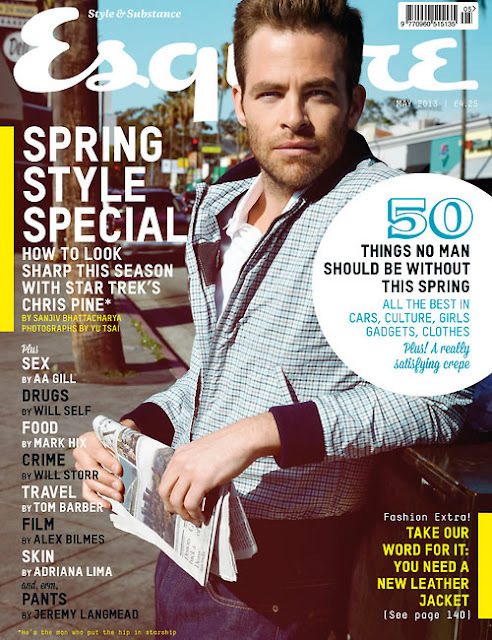 Chris Pine is cool personified for his editorial in Esquire UK‘s May 2013 issue. Chris is photographed by Yu Tsai. Here’s what the 32-year-old actor had to share with Esquire. I wasn’t a fan of Star Trek. It didn’t excite me. All I wanted at that time was a part that I really connected to and when my agent said, ‘Star Trek’, I said, ‘No! Have you not been hearing anything I’ve said? Star Trek is the furthest thing from what I want to do.’ Star Trek scared me a lot. It terrified me, really. Because of the scale, the responsibility, the fact that it was this iconic character. It was the bigger challenge. So I had to take it. When I went to Japan for Star Trek, the fans were at the airport waiting. But they didn’t scream until Benedict [Cumberbatch] got off the plane. And I was like, f**k man: what about me? Drugs were never interesting to me. With drinking, you slowly learn how much you can handle, but with drugs I just don’t know what the f*ck they are or what they do. Also, I was a shy kid, a late bloomer. At 22, I was probably 16 emotionally.